At this time of year there are plenty of apples to peel! Playing the violin, clarinet, French horn, piano or guitar are all a good workout for the hands. 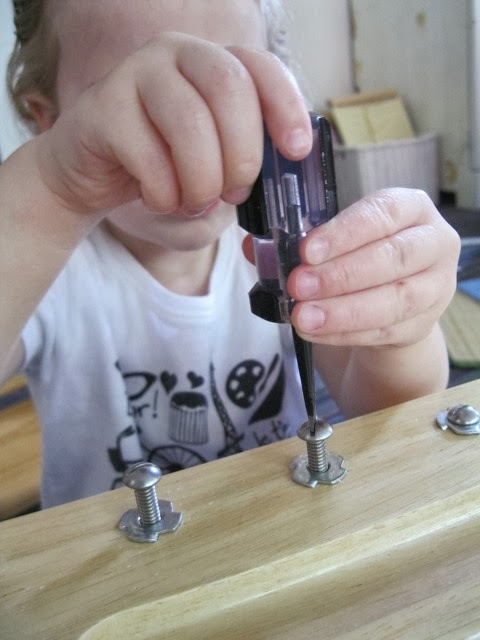 I'm not the only one who has to keep remembering to give the kids work to do with their hands, every day. This post is just a collection of photos of MORE things your children could be doing every day in the classroom and at home (see this post for the first such discussion). Good old soap carving. Even the older kids love it. 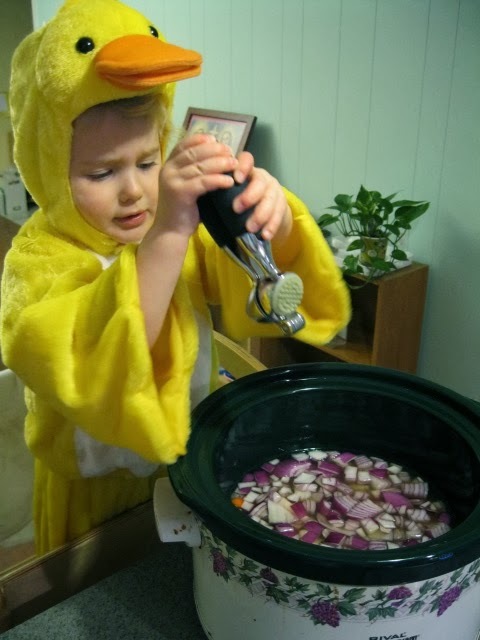 As they help with dinner, they can snip things with the kitchen shears (herbs or, in this case, bacon). Toddlers can put ping-pong balls into this empty Trader Joe's frozen tartlet pan (or any muffin tin). Pounding golf tees into clay, sorting silverware, learning letter sounds from plastic letter magnets .....Happy toddlers, happy parents! 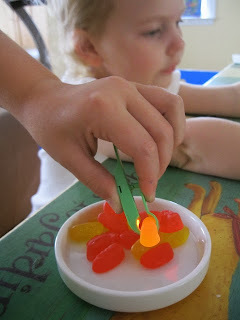 These are edible gummy bugs that are sold with light-up tweezers! 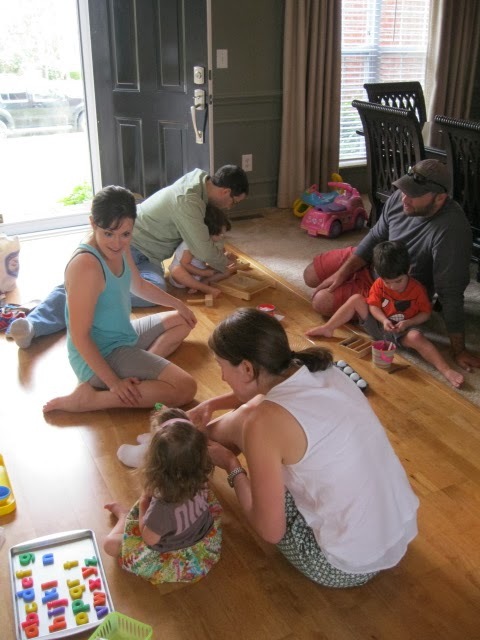 Here, friends at Montessori Mornings help clean up a spill of the lentil transfer work. It takes strength to open cans! Speaking of opening things, most kids like the Open/Close Basket. Mom likes it because it's free to make (just save your empty containers, the weirder the better). 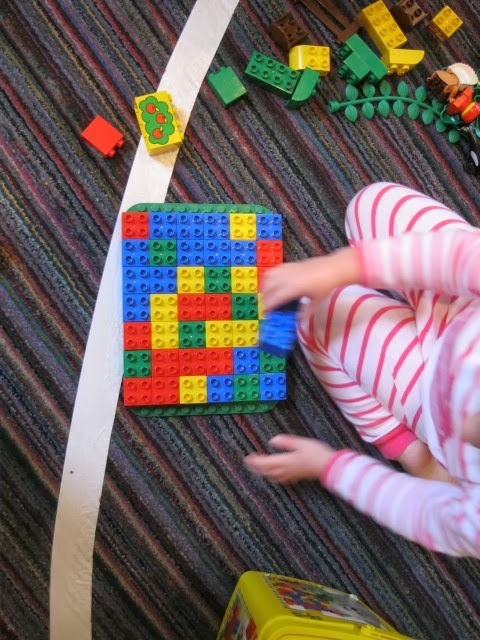 Those little knobs on this puzzle of the frog are great for using the pincer grasp. Picking all kinds of bizarre berries for a nature center (or just for the bottom of Mom's purse!). A bolt board is pretty tricky. 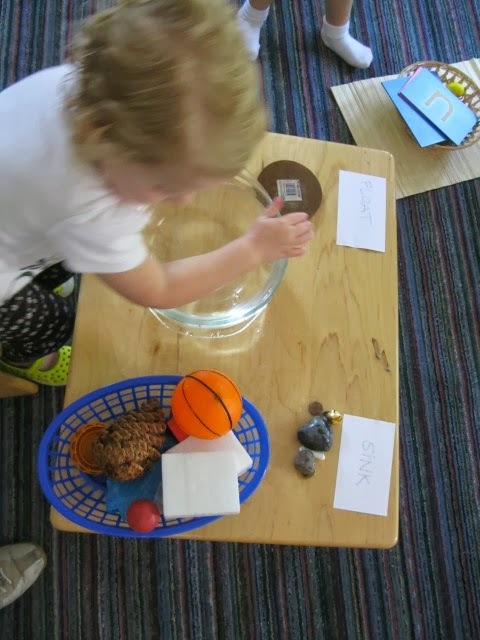 A "Float/Sink" work can be free to put together: just a basket of random stuff and a bowl full of water. When using the Sandpaper Letters, children first sensitize their fingertips by dipping them into a small bowl of water and drying them. The strokes they use to feel the letter's shape mimic the shape and direction of the strokes they will use to eventually write. 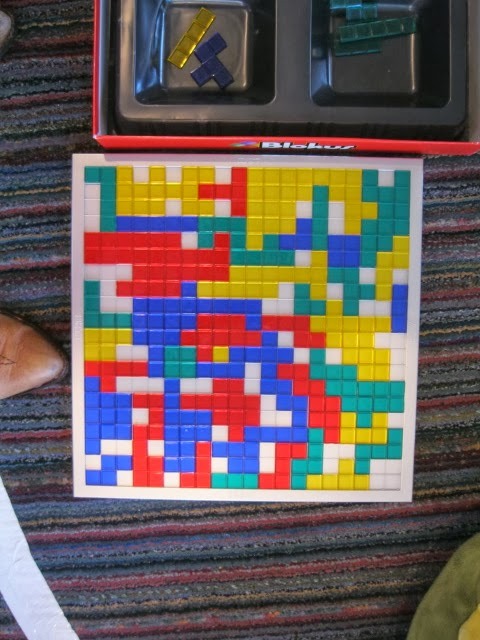 Here mixed ages enjoy matching fabric squares of different textures. "Alleluia" dresses her dolly, who needs snapping, tying, zipping, etc. 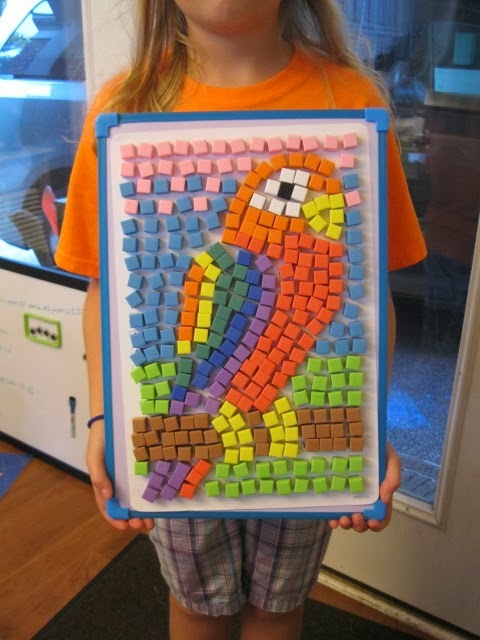 There are tons of kids' mosaic kits out there. 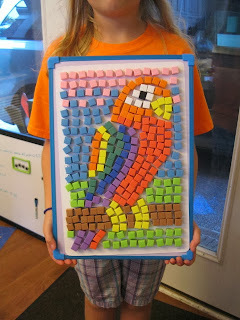 This one has magnetic foam squares. 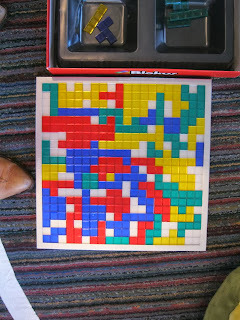 Below, "Alleluia" tries to improvise mosaics by using Blokus and her Duplos to make patterns with colored blocks. 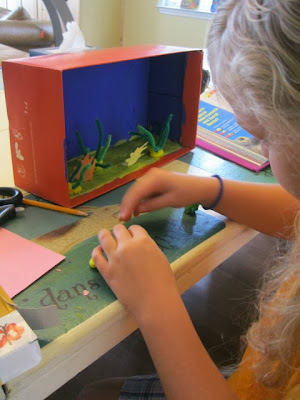 Dioramas that require paper cutting or tearing, ripping tape, painting and clay squishing are great projects for elementary-aged students. Here, "Peel" is making a coral reef. Do YOU have any good ideas to share? Please post some in my comments! Outstanding photos of connected children . Adding some of the mosaic sets to the Christmas list! Love the ping pong idea! Definitely stealing that and incorporating into our work for the week! A will surely love it! Everything looks like so much fun!! I like the web content also. 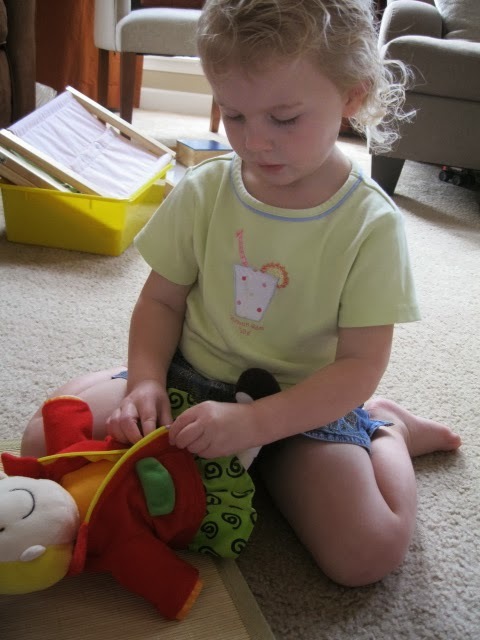 Informal Learning: Language Work in Her PJs?